The first and most obvious safety pointer that applies to everybody who takes to the road on a push bike is to wear a helmet. Cycle helmets are only designed and tested to withstand an impact equivalent to an average weight rider travelling at a speed of 12 mph falling on to a kerb from a height of 1 metre. Because of this riders shouldn't become complacent and rely on their helmet to save their life in an accident. The best way to avoid serious injury is to try and avoid being hit by a car in the first place. Secondly, you should wear reflective clothing and always use front and rear lights if riding at night or if the light is impaired in any way. Another useful safety device is the mirror. This can help you to judge the traffic from every angle. 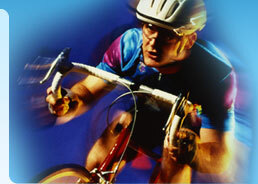 Many bike accidents occur when the car behind you clips your rear wheel. This is not as serious as an accident from the front or from the side, but can still knock you off and cause serious injury. By looking in a mirror from time to time you can assess any potential dangers. Basically if you are prepared to ride on the roads you should take the measures to protect yourself. Motorists can't always see you and unfortunately for much of the time haven't learnt to look out for cyclists. Everyone has a right to be on the road so protect your self as much as you can. Common accidents and how to avoid them You are more likely to be seriously injured in a collision with a car than in a bike only accident. There are one or two car versus bike accident types that are fairly common and that with a bit of foresight can be avoided. They are shown below with some tips for avoiding a deadly collision. If this happens you won't have very long to stop, so the best option is to ride closer to the middle when you are riding down a road with lots of parked cars. Again if the road is fast and narrow avoid this, but judge the road you are on and ride accordingly. It pays to check your bike over before you even get on it. Every time you take it out you should give it the once over to see that the tyres are pumped up and the brakes are working. Car Accident Adviceline www.car-accident-claim.com, 0808 143 43 42, is an independent company that works towards claiming compensation for people who have had a non fault road traffic accidents. Their services are completely free to use as all car hire charges and legal fees are recovered from the person at faults insurance company or written off. By Sophie Evans - Car Accident Adviceline www.car-accident-claim.com 0808 143 43 42 - Claiming compensation for people involved in non-fault accidents.